Back before the days of industrial refrigeration–and ice machines–it was actually far more common to order a heated cocktail from your local barkeep than a chilled one. Today, warmed tipples are generally limited to Hot Toddies and mulled ciders — one of the least inventive arenas in modern mixology. But a handful of contemporary bartenders, steadfastly opposed to anything stale, are dragging the category forward into the future. Mid-March, you might think that your time to experiment here has passed. Don’t allow a few days of warmer weather lull you into a false sense of Spring. Old Man Winter still has a few tricks left up his sinister sleeves. Prepare yourself for any impending Polar Vortex with these adventurous concoctions, designed to warm your weary soul. In Portland, Oregon, Jesse Card of the Bit House Saloon is heating things up with his rendition of a Brazilian punch. 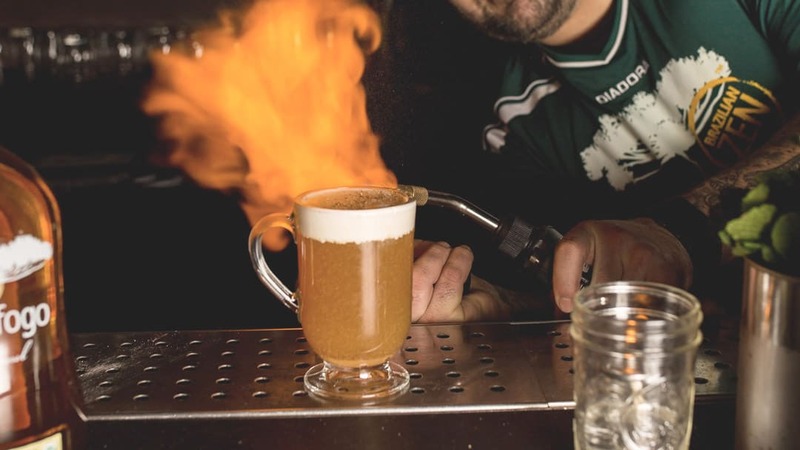 The Quentão (pronounced: ken-tawm) is a Cachaça-based cocktail that he lights on fire –with a blowtorch. It’s a showstopping effect, to be sure. But takeaway the pyrotechnics, and the drink remains pretty damn tasty. You can make it yourself without the flame, by adding hot cider into the mix.